When dealing with small arrays and matrices, one method of exposing parallelism on the GPU is to execute the same cuBLAS call on multiple independent systems simultaneously. While you can do this manually by calling multiple cuBLAS kernels across multiple CUDA streams, batched cuBLAS routines enable such parallelism automatically for certain operations (GEMM, GETRF, GETRI, and TRSM). In this post I’ll show you how to leverage these batched routines from CUDA Fortran. The C interface batched cuBLAS functions use an array of pointers as one of their arguments, where each pointer in the array points to an independent matrix. This poses a problem for Fortran, which does not allow arrays of pointers. To accommodate this argument, we can make use of the data types declared in the ISO_C_BINDING module, in particular the c_devptr type. Let’s illustrate this with a code that calls the batched SGETRF cuBLAS routine. and batchSize, the number of independent n×n matrices on which to perform factorization. Of particular importance in this interface is the use of the variable attributes device and value. The cuBLAS handle h, the size of the matrices n, the leading dimensions lda, and the number of matrices batchSize are all scalar parameters declared in host memory and are therefore passed by value. The integer arrays ipvt and info are output arrays allocated on the device using the device attribute. Of special note in this interface is the array of pointers Aarray. which is a host array of device pointers. The batched cuBLAS calls need the former declaration because cuBLAS distributes matrices to kernel threads on the device. Having defined our interface to cublasSgetrfBatched(), we can now turn to the host code that calls this function. The complete code follows. While most of this code is straightforward, the code that assembles the device array of device pointers, devPtrA_d, merits some discussion. We can use a similar approach for the other batched cuBLAS routines: cublas*getriBatched(), cublas*gemmBatched(), and cublas*trsmBatched(). Note that in cublas*gemmBatched() and cublas*trsmBatched(), the parameters alpha and beta are scalar values passed by reference which can reside either on the host or device depending on the cuBLAS pointer mode. In such cases it is helpful to write a generic interface such as the following. In this interface the *_hmp and *_dpm routines are for host and device pointer modes, respectively, whose interfaces differ only by the absence or presence of the device variable attribute for the alpha and beta arguments. You could further write a wrapper function that calls cublasSetPointerMode() appropriately before executing the batched cuBLAS routine. 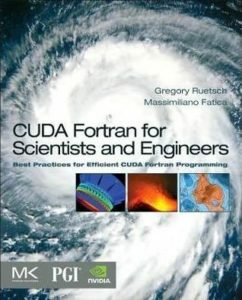 Check out more on CUDA Fortran as well as more CUDA Pro Tips at the NVIDIA Developer Blog.